Geelong’s Gym Fabulous Fun Foto! Published on May 27, 2009 in Branding, Case Study, Do Stuff, Fun and Pre-eminence. 2 Comments Tags: Branding, Branding Ideas, Exponential Marketing Strategies, Fun Photo, Geelong's Gym, Gym In Geelong, Marketing, Signage, Using Photos To Market Your Business. 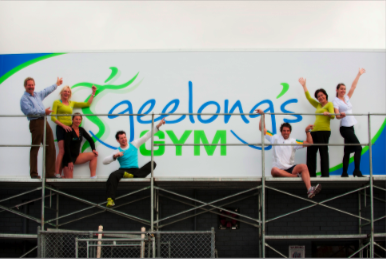 Whenever you do something within your business, you should take advantage of turning it into a FUN activity and then leveraging it as a marketing tool – like Geelong’s Gym did recently when they put up their new sign as part of their corporate facelift and branding makeover. They got their staff up on the scaffolding and turned it into a fabulous fun foto opportunity! Geelong's Gym Puts Up New Sign! What do you have coming up that you can turn into a Fun Foto opportunity?